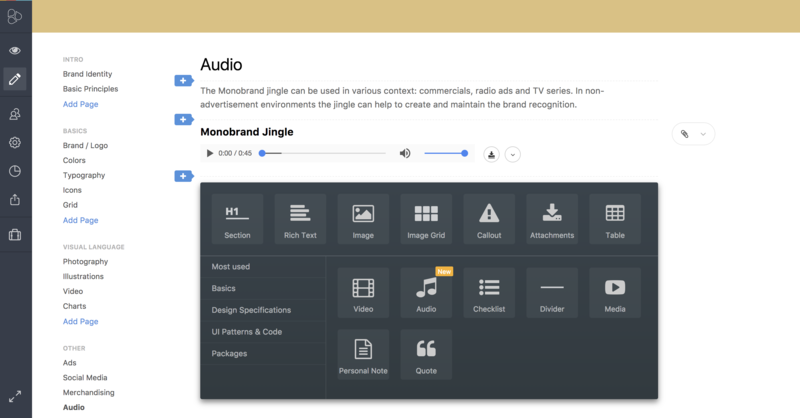 The Audio Block allows you to upload, play and download audio files to your Style Guide. This way you can for example upload jingles, audio files, commercials, radio ad snippets and much more. You can also set whether viewers get the option to download the audio file or not. This setting can be set while you are in edit mode (see image below). Additionally, you can add attachments if you want to add raw or alternative files to make it easier for your colleagues to reuse the audio files. Frontify supports all the HTML-5 formats (e.g. MP3). Ultimately, there might be slight differences in terms of file support - depending on your browser.